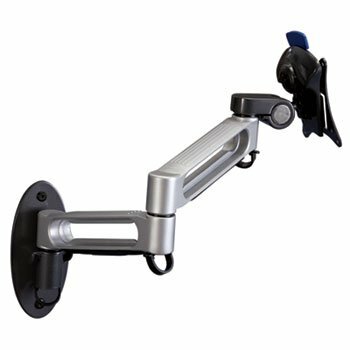 This wall mount folds out and features a quick release tab for easy mounting and dismounting of the monitor. The arm features 30 of tilt adjustment in either direction, 180 of pan adjustment and 180 rotation. Sturdy and durable. Wall/Ceiling Mounts amp;amp; Hardware Type: Flat Panel Wall Mount Mounting: Wall Depth: 15amp;quot; Width: 17amp;quot;.